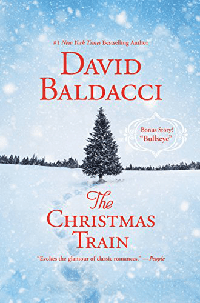 David Baldacci takes a break from thrillers to tread into Nicholas Sparks territory with The Christmas Train novel. Readers looking for Baldacci’s skilled plot twists and action scenes will be disappointed with a story more schlock than shock. I’m not sure why authors, popular within a certain genre crossover, perhaps there’s a literary itch that needs to be scratched or an idea that needs to meet paper but when they do they can expect a flood of negative reviews on bookselling sites. But for all of the bad reviews written about The Christmas Train, there were people that found the work a happy surprise and one they embraced. The Christmas Train is a feel-good holiday read. Baldacci’s world on the tracks is one full of good people who operate with a happy rationale. Everyone Tom encounters is well-intentioned and wish only good for their fellow man. The story of The Christmas Train is about one man really getting to know himself through extended naval gazing and reliving the life he’s led until the moment he boarded the train. He’s only held one person soul deep and she went her own way — so his relationships ever since have been shallow and a matter of convenience and mutual pleasure. He’s lost his purpose and has coasted on his name, and perhaps as his father intended, the time he spends on the train is useful for nothing but introspection and coming to terms with his changing situation. When he finds himself trapped with the one that got away, is there a second chance at first love? As RuPaul Charles says, “Honey if you can’t love yourself, how in the hell can you love anyone else?” Likely because Tom’s personal story is so intense, the people he encounters, for the most part, are light and entertaining. There are people that look specifically for clean reads that when finished, leave the reader with a warm glow of happiness. While I love a good happy ending (happy is subjective and not always what we think it should be), I have never been the kissing in the snow under a happy rainbow kind of reader (not an actual event in The Christmas Train). If you’re into the human experience, love a happy ending and love the holidays, The Christmas Train is one not to be missed. Pick it up today. For more information about David Baldacci visit his website. You can connect with him on Goodreads, Facebook, YouTube and Twitter @davidbaldacci. Series readers can track his books on FictFact.